Saturday we took our great nephew Jordan to Campbell Field for lunch. Campbell Field is a small meat and three restaurant out in the boonies. It's not much different than small restaurants all across the country except that it's situated at the edge of one of the few grass landing strips for small planes in the south. 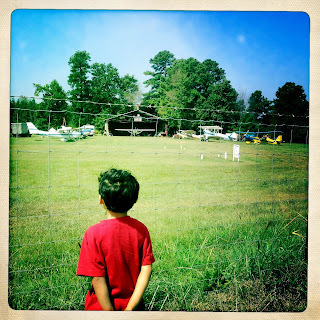 The place is an attraction in that it serves good food, but the grass strip is a novelty for diners and pilots of small planes. It's not uncommon to be sitting there eating lunch and see a small aircraft floating down toward the field like a feather. home, where ever that is. Before we ordered, I walked across the county road separating the restaurant from the landing strip to give Jordan a better look at the small planes. He was fascinated. I wish a hungry pilot had flown in for lunch, but that didn't happen yesterday. That's OK, it will give us an excuse to go up to Campbell Field again. How neat--a fly-in instead of a drive-in restaurant!! What a great quirky place for a restaurant! Love the idea of pilots landing, walking over to have a bite to eat and then heading off again! LOL! Brilliant! That sounds like great fun! I remember sitting in a restaurant on State Route 96 in Upstate New York when I heard the unmistakable sound of a helicopter. I turned to look out the large window to see one landing on the far edge of the parking lot away from the cars parked there. Judging from the greetings the pilot received as he came in, this was a common occurrence. There was no landing strip for small planes, but then, helicopters can land in a lot more places than small planes can! I hope you and your great nephew get to see a plane land next time. It's so exciting! As much as I don't enjoy flying..I do enjoy watching planes take off and land. We live very near the Ashland airport...it's for small planes and many of them fly over the Pines on a regular basis..now all I need to do is open a diner and maybe have one land! You always find such fun ways to entertain that great nephew of yours...he's a lucky kiddo to have such loving relatives! Enjoy your Labor Day! What a lovely place to spend time with Jordan! Wonderful place to have a diner. I've never heard of it, and I find it interesting to read about and see photos. What's "meat and three"? I've never heard of that. When we lived near Seattle we loved going to Ivar's Indian Salmon Restaurant on Lake Union. Sometimes we'd see a plane land on the lake. Meat and three is where you get a meat and three veggies with sweet tea. I'd like to see a plane land on a lake myself.